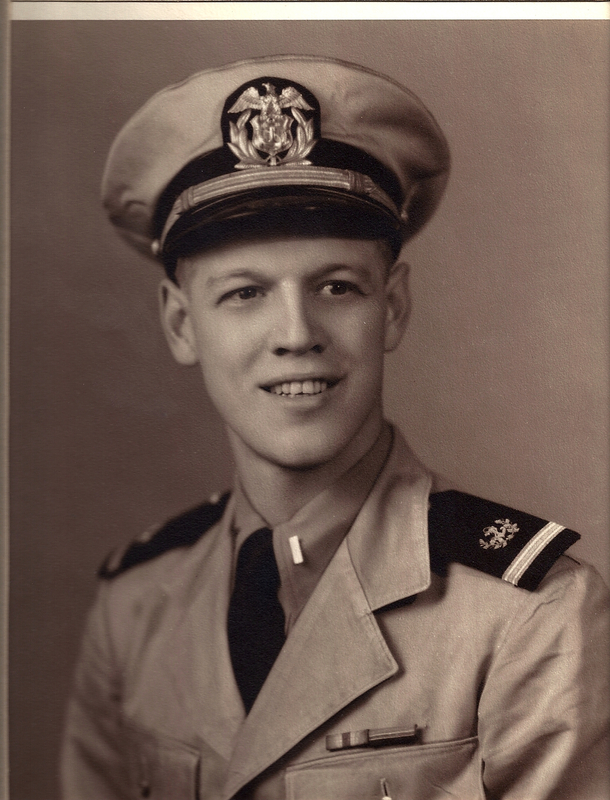 In honor of Veteran’s Day today I am writing a post about my grandfather, Grandpa Stan. He was a Merchant Marine during World War II and I knew that, but I never really understood what it meant. And just like many people of that generation, he never talked about what happened during his service during the war. So I never thought much about his service, even when my mom told me about a medal he received from some town in Russia while I was in college (typical self-absorbed college kid!). Today I am rectifying that mistake – I’ve learned about the Merchant Marines and why my grandpa got a medal from a Russian town and I’m going to share that knowledge with all of you. The United States Merchant Marine is responsible for operating marine vessels that transport goods and services. But during times of war, it can also operate as an auxiliary to the Navy, delivering troops and supplies for the military. During World War II, the Merchant Marines were vital to the Allies’ success – transporting the personnel, supplies, and equipment needed for the military effort. This key contribution was targeted by the enemy, however, and the Merchant Marines actually suffered a greater percentage of war-related deaths than any other U.S. service, with 1 in 26 mariners during World War II dying in the line of duty. The mariners faced many deadly attacks, but one that was notoriously dangerous was known as the Murmansk Run. Murmansk, a Russian seaport located north of the Arctic Circle, was a key city for the Allies because its harbor didn’t freeze in the winter. So the Allies used this city to keep supplies running to the Russians, while the Germans used submarines and surface warships (along with bases in the north of occupied Norway) to try and stop the flow of supplies to the Russian front. These convoys of vulnerable merchant marine ships were not only crucial to the Allies’ war efforts but also to the survival of the Russians under attack and blocked off by the Germans. And it was for this service that my grandpa received his Russian medal. He was one of the mariners that risked his life to deliver supplies (including salt pork, shoes, and tanks) to Murmansk in 1945. Grandpa Stan was the Executive Officer on the William Wheelright, part of a convoy that sailed out of New York and stopped in Scotland for refueling before heading north of Norway and to Murmansk, facing attacks by the Germans along that route. They landed in Murmansk just as President Roosevelt died and the Germans surrendered the same day they arrived back in Scotland. 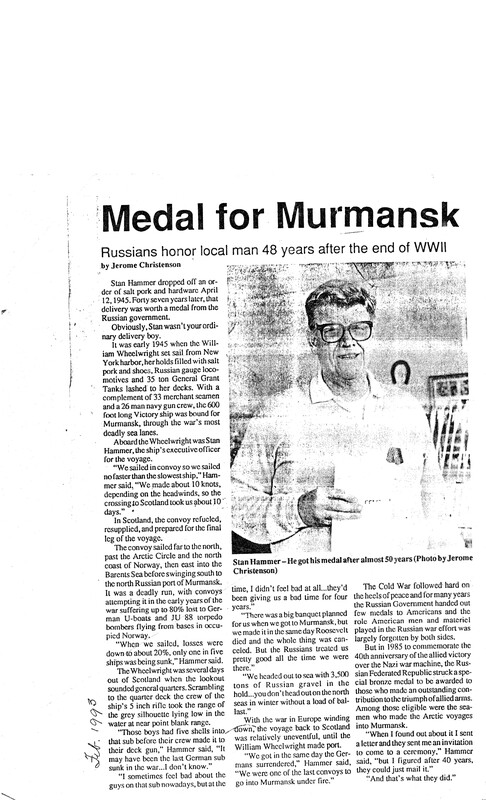 My grandfather was in one of the last convoys to make the dangerous Murmansk Run. And forty years later, in 1985, the Russian Federated Republic awarded a bronze medal to those who had made an outstanding contribution to the Allies’ effort, including those who made the Murmansk Run. Grandpa Stan was invited to a ceremony in Russia but turned it down, asking them to mail the medal instead (he never liked to make a fuss over anything). So, this Veteran’s Day, I’m proud to learn a little more about the risks taken – and sacrifices made – by the veterans among us. In honor of my grandfather and the many other men and women (both civilian and military) who have risked (or lost) their lives defending us, I want to say thank you. Your contribution and bravery are always remembered, but today we all take a moment to pause and reflect upon the heavy price you paid for the rest of us. And I’m glad I’ve learned a little more about my grandfather, although I wish I had learned this before he passed. I love you, Grandpa.